Google, probably used your search history and decided that ad was probably ok. Given that Dora content is uploaded illegally to Youtube, you’d do better reporting it rather than letting your daughter watch it via an unmonitored source like Youtube. Interesting ideas, but we were not logged onto anything at the time…not to email or to any other service provider. Technical people could talk more sensibly about this, but my understanding is that there are some pretty basic controls that YouTube could adopt and alcohol advertisers could adopt to ensure that alcohol ads are only streamed in connection with content for viewers 18+. Luke is spot on. If your daughter is watching Dora on youtube then she is most likly watching an illegal (pirated) version of the show, tied to an unofficial account. My recommendation would be to legally source the content for your daughter. Pretty innocent, really, letting your child watch Dora on YouTube…I was not on an age-restricted site, and this was self-evidently children’s content. This was not an isolated incident. The ABAC Scheme has dismissed a number of complaints because their Code does not address the placement of alcohol advertising. 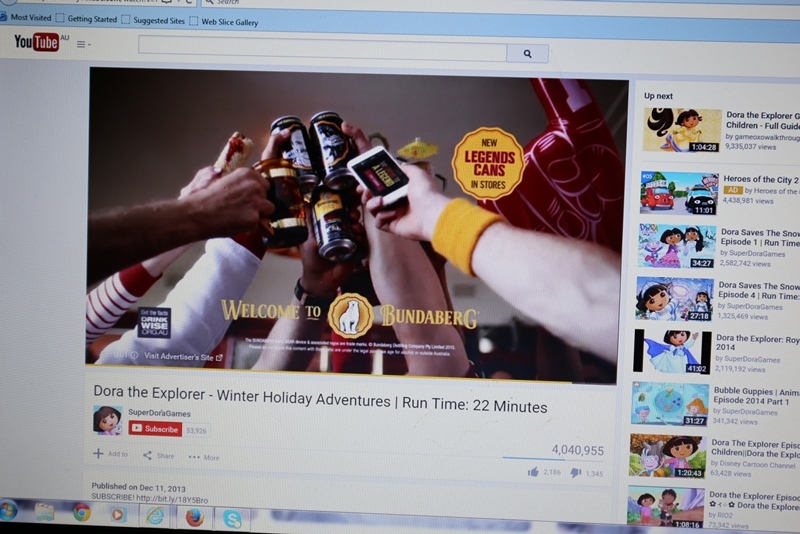 If alcohol companies are going to advertise online, they need to ensure that they don’t stream ads in proximity to what by any definition is young children’s content. Otherwise they are advertising alcohol at children. I encountered a similar expereince in 2012 when my pre-school daughter was listening to Play School on Spotify. She saw and heard not only ads for Absolut Vodka but also for Carlton Dry. 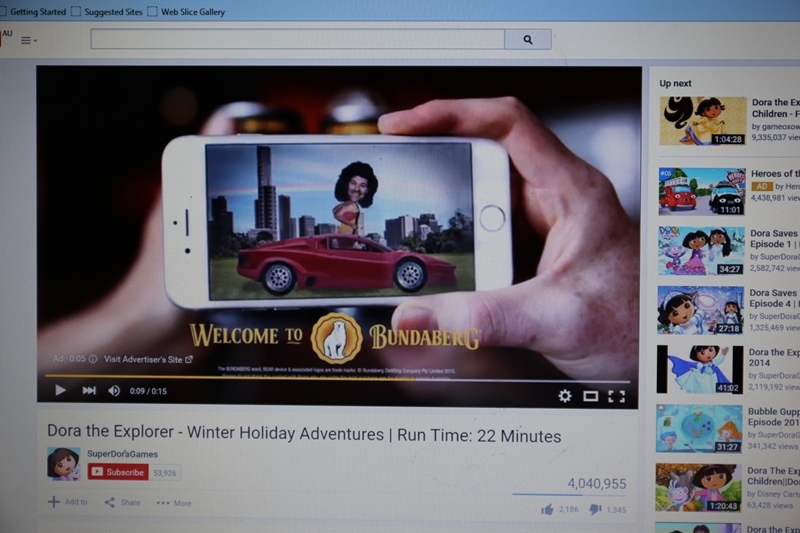 I reported both ads to the Advertising Standards Bureau who dismissed both complaints. I’d be more than happy to share their response with you. Let me know. Thank you, I’d be interested to learn the reasons why the complaint was dismissed. Was it publicly reported? Not sure if it was publically reported, I guess it might have been, I was contacted by a journo about not long after. I’ll forward on the reports to your email listed on this blog. Ads on the Internet almost all come through Google or one of the other few big online advertisement agencies. So when you surf the web on your browser, the ad agency can follow you around and look at what you search for and what you interact with. From this they get a very good idea on who you are and what your interests are, which they in turn use to specifically target their ads to you. So if you see ads anywhere online, then be assured: They’re not primarily targeted at people who frequent the current page / watch the current video. They’re targeted at the person who usually uses this computer with this browser. I assume that it would be very hard to automatically tag user-uploaded videos as ‘predominantly for minors’. (With websites like ‘Bratz’ that would be far easier, though.) I am a father myself, and while I don’t usually get ads for alcohol (apparently Google knows I’m a teatotaler), I do get ads for movies that are clearly not rated PG before the Minecraft Let’s plays that my 6 year old son likes to watch. I’m sorry, if you let your daughter watch Youtube, you have to stay with her. (After all, the next video might be a user-generated one where Dora does very … unchildlike things.) Or you have to go to Netflix or the like. I am hearing that: if I was logged into a google account, then by definition I am an adult. If I wasn’t, then google assumes I am an adult. OK, thanks for your comments.